It’s the first official weekend of summer, 2008, in the northern hemisphere, and we’re off to the movies! Silly, right? Warm, beautiful day outside. Cold, dark theatre inside. But since I don’t recreate too well (Achilles tendinosis still an issue), we take our entertainment where we can. It’s just deplorable when real life gets in the way of my blogging addiction. But, perhaps you’ll indulge me… it’s summertime, after all. In cataclysmic global warming news, the Panama Canal became obsolete (at least during the summer months) today. This story has been developing all season, and, for once, the term “geopolitics” is not idly invoked. PARIS (AP) — Arctic ice has shrunk to the lowest level on record, new satellite images show, raising the possibility that the Northwest Passage that eluded famous explorers will become an open shipping lane. The European Space Agency said nearly 200 satellite photos this month taken together showed an ice-free passage along northern Canada, Alaska and Greenland, and ice retreating to its lowest level since such images were first taken in 1978. The waters are exposing unexplored resources, and vessels could trim thousands of miles from Europe to Asia by bypassing the Panama Canal. The seasonal ebb and flow of ice levels has already opened up a slim summer window for ships. Leif Toudal Pedersen, of the Danish National Space Center, said that Arctic ice has shrunk to some 1 million square miles. The previous low was 1.5 million square miles, in 2005. ”The strong reduction in just one year certainly raises flags that the ice (in summer) may disappear much sooner than expected,” Pedersen said in an ESA statement posted on its Web site Friday. Canada is one of those contenders. Just a week after Canada and the U.S. agreed to disagree over the ownership of the Northwest Passage, this summer’s record melt of Arctic sea ice has unlocked the polar shipping route more completely than ever before, the U.S. National Snow and Ice Data Center has announced. “It’s open,” Mark Serreze, a senior scientist with research institute based in Boulder, Colo., said in an interview Tuesday. And here’s the link to the NYTimes’ version of today’s AP story. The Arctic has belatedly become the latest, but not the last, uninhabited area in our solar system to be contested by nations with imperial ambitions, aided by the fact that there is apparently less of it than any time in the past 10,000 years. Russia, Canada and the U.S.A. have been wrangling over navigation and natural resources rights, and this “discussion” promises to continue to warm up, similar to the average daily temperatures up there. Henry Hudson and all who came after absolutely had the right idea. It took the U.S. Navy and its spanking new nuclear submarine to actually traverse the Northwest Passage for the first time, albeit below the ice. And now, less ice. Gotta figure, pretty soon supertankers and super container ships. And they won’t be able to complain about it being too dark to navigate! All can debate to their hearts’ content whether this warming trend is part of a planetary cycle that has maintained for eons, or whether all those SUV’s have taken Planet Earth to the brink. Really doesn’t matter, since the fact is, no one any longer can deny with a straight face that the globe is warming. 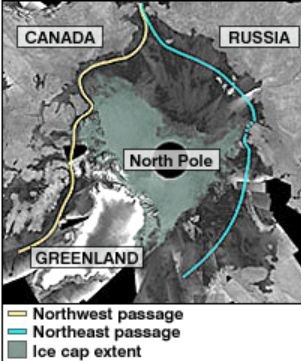 The satellite images from this summer showing a true Northwest Passage have iced that one, so to speak. This entry was posted on Sunday, June 22nd, 2008 at 3:00 pm and is filed under Geopolitics, Global trade, History, Science, Technology. You can follow any responses to this entry through the RSS 2.0 feed. You can leave a response, or trackback from your own site. And Antarctic ice is at its thickest since measurements were taken. Thanks for your grounded scientific input.